Now Back In Stock – Order Today! 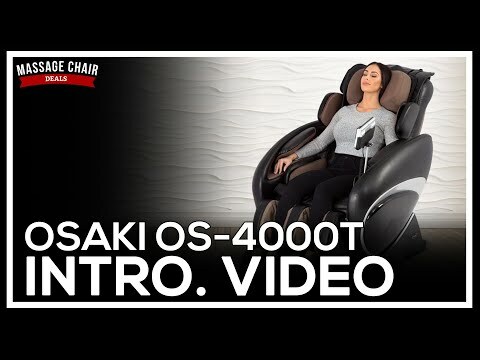 The Osaki OS-4000T is a full function massage chair that automatically detects the natural curvature of the human body and adjusts the massage to fit. The Zero Gravity position elevates the legs above the heart and more evenly distributes your weight. The OS-4000T also features hip air massage, seat vibration massage, neck and shoulder air massage, air and vibration arm massage, heat therapy for your lumbar/lower back area, and foot rollers. Choosing your massage is easy with the 7 unique auto programs: Muscle Relief, Thai, Stretching, Anti-stress, Demo, Neck/Shoulder, and Back/Lumbar, all with one touch of a button. Massage combinations are endless with 6 of the most desirable techniques: Shiatsu, Swedish, Kneading, Clapping, Rolling, and Combo. Add to that 5 speed and intensity settings and you have complete control of your massage for ultimate relaxation. There is also automatic massage settings for the upper body (shoulder, neck, back and lumbar) and the lower body (buttock, thigh, calves and feet). You can manually adjust the massage for the upper body with three options: full body, partial and fixed. Inspired by NASA technology, the Zero Gravity position is the perfect position to enjoy a massage, aligning your back relative to your thigh at an optimal level of comfort. When reclined into the Zero Gravity position, the complete weight of your back is virtually supported by the backrest which maximizes the intensity of the massage. There are two stages of Zero Gravity, the 2nd being more reclined, relative to the seat base. The Zero Gravity position relieves pressure on the spine, relaxes the neck and back, increases blood oxygen levels, and expands lung capacity. When reclined fully, to where your legs are higher than your heart level, the therapeutic effects are incredibly effective and may be felt immediately. Located on the bottom of the feet are 2 rows of spinning reflexology massagers which provide a soothing kneading style application. As the rollers spin it will stimulate acupuncture points. Additionally, the airbags inflate and deflate simultaneously on the sides of the feet, which push the bottoms of the feet into closer contact with the foot rollers. This results in a much deeper foot sole roller massage. This is a perfect feature for those who have sore and tired feet. Equipped with the latest technology, the Computer Body Scan allows for the rollers to map the back curvature with even more accuracy, which translates into a more precise massage that hits all the key areas. Based on your weight and height, the OS-4000T makes micro-adjustments which makes each massage feel like a customized experience. Ergonomically designed with the shape and curvature of the human spine in mind, the S-Track Robot provides support to your neck, back and lumbar area, according to your body curve. This, in turn, increases the effectiveness of your massage. Osaki has re-engineered and has developed the next generation of air massage technology, streamlining the air massager to a lower count. Through innovative engineering, we have reduced the total number of airbags but have increased the volume and surface area of massage. By doing so the total number of working valves has drastically reduced from the prior model. This ultimately puts less stress on the chair, making it one of the most mechanically sound massage chairs on the market. The OS-4000T includes 38 airbags, covering all the areas not massaged by the roller system. This includes the outer shoulders, arms, calves, the waist/hips, inside the seat, and inside the neck/head pillow. The combination of the OS-4000T’s back rollers and airbag system makes this system a full body massage chair — covering everything from the head all the way down to the bottoms of the feet. Along with mechanical advancement and material upgrades, the OS-4000T now features a durable spandex pocket which allows you to massage your arm and hands. The bottom portion of the arm massager has been lined with small rubber bumps to invigorate the senses. Sit back and relax as the the airbags compress on the top and bottom of your forearms and hands. The fully automatic, luxurious OS-4000T is designed to make every movement effortless. The simple to use remote control allows you to operate the foot extension, leg rest, recline, and the Zero Gravity position. Located on the side of the main remote you will find a compact wireless remote allowing you to control the main features of the chair without having to struggle to reach the main remote while in the reclined position. The OS-4000T features 14 airbags that inflate and apply a compression massage for your calves and feet. In addition, spinning rollers are located along the bottom foot massager that apply a concentrated pin-point kneading massage. In the upper to mid portion of the chair, the airbags are programmed to inflate at independent times, which causes the body to twist, creating an enjoyable deep stretch. Stretching is also applied to the shoulders, lower back, hips and thighs. The OS-4000T’s lower back region features two heating pads that enhance the massage experience. Research has shown that lumbar heat therapy provides relief to those suffering from lower back pain. It does so by increasing the body’s oxygen flow, which in turn plays a role in healing damaged tissue. Heat therapy also forces your lower back to press more firmly against the backrest for a stronger and deeper massage. The OS-4000T remote boasts one of the largest viewing screens to easily visualize what functions the chair has activated. There is also a flip down cover to access the manual functions of the chair. The remote allows you to select the massage type, intensity, speed and location. In the manual mode, you can also independently select a specific area of the body you want the chair to massage with the rollers and/or the airbags. Manual massage techniques include kneading, tapping, shiatsu, rolling, combination and Swedish. The air intensity of the airbags can be controlled up to 5 levels. Choose from mild to strong for both the back and lower body. The roller heads that apply the massage to the back can be extended outwards, causing the rollers to press more firmly along the back. This will result in a more vigorous massage. Choose from Wide, Medium & Narrow. If you want the massage heads to concentrate on the outer shoulders and outer back, choose the wider option. If you want the massage heads to be closer together near the middle of the back, choose the narrower option. The calf and foot massager is capable of making adjustments according to each individual’s leg length, ensuring that the massage airbags are concentrating on the correct areas. At the start of the massage, the chair will fully extend out and then retract. Once the foot massager has reached the desired length, firmly press down along the toes to indicate to the chair to stop. Located in the seat base is a vibration plate that provides a vibration massage to the back of the thighs and buttocks. Choose from the straight-out-of-the-box Muscle Relief, Thai, Stretching, Anti-stress, Demo, Neck/Shoulder, and Back/Lumbar options. Options include Rolling, Kneading, Clapping, Shiatsu, Swedish and Combo. You can select to receive a (1) Full Body massage; (2) target a Partial region of the body; or (3) target a Fixed, specific area of the body. 5-30 minutes of usage can be programmed. You can increase the duration of the massage in 5 minute increments, up to 30 minutes. This is a safety measure to ensure that if you fall asleep, the massage will stop running to prevent any injuries. The OS-4000T is an all-in-one mid-strength massage chair that targets the back, shoulders, neck, arms, hands, hips, lumbar, buttocks, thighs, calves and feet. Suggested User Height 5’2 – 6’2 ft. Weight Product gross weight: 284 lbs. Product net weight: 214 lbs. I purchased the Osaki OS4000T Zero Gravity Massage chair for my husband’s birthday. He is an independent owner operator and spends countless hours driving. With that being said when he is home, this chair soothes the aches and pains in his lower back, tired muscles in his legs and feet, helps circulate blood flow due to long durations if sitting, and massages his feet. And added plus is the heating option, helps relax and soothe a tired body. He absolutely loves this chair. Great quality for a great price. Even our granddaughter loves it. Along with me! Definitely worth the purchase. I even let our family and friends experience the massage chair. Hands down, a huge win. Thanks for an awesome chair at an awesome price. I am very pleased with the Osaki massage chair and the courtesy of customer service representative, Mike whom was extremely polite and understanding and always their for any questions I had. Also very happy with the delivery to my door. Really awesome customer service. I highly recommend this chair among others to whomever has whole body impairment. It is the best chair I have ever owned! Thank you very much. We have owned an OSAKI 4000T for ~8 years and it it is still as comfortable and reliable as it was when new. Love this chair. Especially like the zero gravity, anti stress and calve massage. Thank you Helen for getting this for us, really helps our back pain. Also helps relieve muscle cramps in our legs. I have owned this chair for three months now. The only night my wife and I have not used it was on the Super Bowl. This chair was the best purchase we ever made. We both feel spoiled knowing that every night we get to relax like this. If you are reading this it means you are doing the same thing I did three months ago. You have come to the conclusion that this chair, at this price point, seems to be the best one. I can tell you that this is one purchase that both my wife and I do not regret. DO IT! The assembly took us 30 minutes, super easy, and the build quality is solid. Congrats on your new life after you buy this chair. Great chair! Great service! soooo glad i found this site! I had been looking for over a year, and this was the best price, hands down! We purchased the Osaki 4000T in December 2017. The chair delivers on what is promised and is of excellent quality. I assembled the chair with the help of my son-in-law in under 30 minutes. It was not at all difficult. The key selling point for our purchase was massagechairdeals.com customer service. They were knowledgeable and most helpful in our research of the products. They made the entire process easy and comfortable. Thanks for a great product. Great chair for the money. Lacks the L rollers that would cost thousands more. The chair gives you 90% of all you would ever want.If you demand that 10% more, it will cost you dearly. We sat in a few chairs at Brookstone but but none of them met our satisfaction or were out of our budget. There were no other stores in our local area to try out chairs prior to buying so we looked around online and constantly saw positive reviews for the OS4000T so we spoke to a customer service representative about this model and he agreed it would be good for our family based on the features we were looking for and our budget. So far, it’s excellent! The only annoying trait about this chair is that it automatically goes back into the upward position after the 30 minute program and you have to restart the massage. For the fairly inexpensive chair that this is we’ve looked past this though. The rollers combined with the airbags, heating and ZeroG are very relaxing and doesn’t leave me wanting more. This is a better machine than the Brookstone models we tested out and it’s far less expensive too. Good buy and a beneficial investment in my family’s health. My husband bought me this chair several months ago. I always came home with backaches from standing at my job all day on hard floors and I think he was tired of giving me back rubs every night! This chair is the best gift he has ever given me! I come home from work and melt into my chair. It relaxes me so much, I usually fall asleep. The heat feature relaxes your muscles while you can chose the massage on the areas that hurt. It has an intensity feature so you can chose a light massage or a stronger one. Everyone who sits in this chair wants one. I could not recommend more. 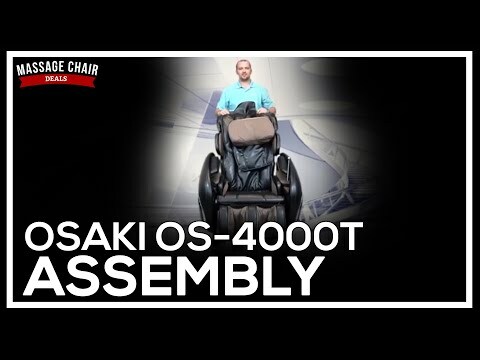 We are thrilled with the Osaki OS4000T Zero Gravity Chair! I like a more gentle massage and my husband likes a more vigorous massage & this chair takes care of both of our needs! My favorite is the “stress relief” program…especially right before I go to bed! So relaxing! There are so many functions…we have yet to discover all this chair can do! The price is right…so much less than you would expect from a chair that delivers so much! You will be delighted with this chair & your family will love it too! Since purchasing my chair I have used it everyday. I miss it when I’m traveling. It is one of the best purchases that I’ve ever made. Wish I had gotten it sooner. Great Price and service. Package was about 250 lbs. Heavy, but had two strong boys to help move into place. After removing from box, wife and I had assembled in 30 minutes. Pretty simple assembly, hardest part was connecting air hoses to back and side panels – short hoses. My wife said this is the best chair she has ever been in (she is 5’5″). I have very limited experience but love this thing. Have been using it for 2 days now and I had more energy today than I have had in a very long time…like I am 10 years younger with no back pain, which I have had for the past two months. I do have one negative point, but like the chair enough to give it 5 stars. I am 6’1″ tall and 220 lbs. My shoulders barely squeeze into the side shoulder panels, much bigger and I would likely not fit. Because of my height I have a very hard time keeping my arms in the arm pockets, because the shoulder side panels pinch my arms. My wife has no issue with this. Additionally I do not receive any neck massage because of my height while my wife reports she gets a very nice neck massage. Other than that, I receive a great massage. So the chair is very well designed for a shorter person, but accommodates taller people. But I still think it is amazing!! Additionally, I have seen that others report that this unit does not give a deep enough massage. I was a little worried about this but bought it anyway. I have used full strength but also had to turn down the strength once…was a bit too deep. Instructions say you can fold back padding for a deeper massage. I don’t think I will ever need to do this. We got this over a year ago. For the price, it’s unbeatable. I see people complaining of assembly. Except for the size of the components, the assembly is not that difficult. Easy to assemble if you’ve two people. Sometimes some tools fitting to some screws could be a bit difficult. Overall they’ve done a great job. Manual is pretty useless. For the amount of features on the remote, you’d expect everything to be detailed. But you don’t really need a manual for this except for the assembly. You can figure it out all by yourself. It’s got extensive custom controls and trust me except me and the dog 😉 , no one can figure out to use some of the controls. The programmed massages are good. I like one of two of them mostly and repeat the same. But the spot massages are great. The zero gravity is fantastic. There’s also a custom adjustment after setting to zero gravity you can lean the chair further back all the way to a steep angle and it’s very good for blood flow to your head. The chair is perfectly balanced although you would think at that you’d fall back, but you won’t. I love this aspect. Also love the heat for the back. Esp. if the back muscles are sore, the heat is really great. If you try other brands for these features it may cost well over 5K. So for less than 3K, you can’t beat it. We didn’t see any problems with the mounted remote. The mini remote is a IR remote so you’ve to point it to the main remote. They could have made it RF remote and it would have been fantastic, so you don’t have to take your hand out of the chair everytime to adjust during massage. ONLY WARNING: When you’re planning on moving , make sure if you can you move the whole chair as is. Otherwise if you disassemble it by disconnecting the air pump pipes, it would be a bit difficult to hook them back. Because they run a metal spring inside each of these rubber pipes, they tend to stick out, which makes it extremely difficult to plug them back. Also the air pipes are snug and doesn’t have too much length in some areas and it would take great effort to plug them right. I’m 6’4″ and a bit tall but this chair works well for me. My wife loves it. It appears to be very robust. We saw similar chairs at the furniture store for $5000.00 and this one looks better and was delivered to our door. Very pleased! Great service. Great chair – is being used by the entire family….. feel relaxed and refreshed after just 15 min. The chair comes with a lot of padding that prevents the massage rollers from really working your upper and lower back. I recommend REMOVING the velcro padding on the back of the seat (especially the PILLOW) to add to the intensity of the massage. I was disappointed with the strength and called massagechairdeals to see if I can improve it and they recommended this. It has since given a deeper massage. Thanks!! I have never once considered purchasing a massage chair. I saw the Osaki 4000T on display at my local Costco in the LA area and my partner and I tried it out & we instantly fell in love with it. I have been going to my masseuse for over five years for tremendous lower back pain due to the nature of my job and have spent an incredible amount of money for massages about once a month– which, granted, have been exceptional. When I sat in this chair I fell in love with it and went twice to test it out and seriously considered purchasing it upon searching reviews. Costco was offering a special deal on it significantly less than what other online venders were offering for it and I was about to pull the trigger on it until I called this site and a rep matched their price — and bonus — without the notoriously high California state taxes. Great deal! The chair was shipped it our home in about a week. The chair weighs 250 pounds and it came in two large boxes. Definitely plan to have a game plan to have someone help bring it into your home when they ship it out to you. The assembly itself wasn’t an issue for us and we were able to put it together in an hr. Good deal, an even better chair and I have experienced SIGNIFICANT reduction in lower back pain already after using the chair at least once a day for the past couple of months. Great value massage chair that does everything that it promises and more. I think you’d be hard pressed to find another basic (and a whole lot more) medium-strength chair in this price range for all the features it offers. Was shipped in just over a week. My family and I are satisfied with it and have already placed another order my in-laws. Thanks. I ordered this chair for my wife a few days after black Friday and even though there were just a few of this model in stock in the color my wife would have liked best, I was grateful that one of the customer service reps I talked to was able to save one for me and helped me coordinate a delivery date that was timed for the week of Christmas. I was able to assemble it with two of my brothers that were in town relatively quickly. It made for a great chair for the entire family to use while they were at our home for the holidays and I was impressed by how durable and sturdily built it was for the amount of cycles it powered through during that week. Since my family has left, the wife has used it at least once a day and is happy with the moderate massage it provides for her lower back. I suffer from chronic back pain and have gone through thousands of dollars on massage therapy over the past five years as recommended by my doctor and needed an affordable massage chair that targeted the lower and upper back and this one fits the bill. For those of you who wish to have more pressure out of this chair, I recommend flipping the pillow over for extra upper back intensity. 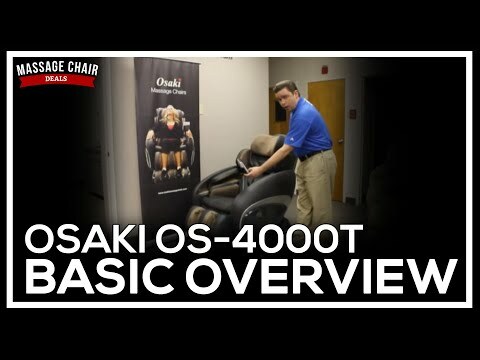 this chair doesn’t have all the bells and whistles that the more expensive Osaki models have…but it literally had every feature we were looking for and it gives an excllent masssage. if you want all the fancy feature such as stretching, 3d rollers, etc, look elsewhere. the “basics” like the foot rollers and heat in addition to the great massage were more then enough to give us hours of relaxation and enjoyment. This was originally called the Osaki-4000 but since Osaki tacked on the foot rollers feature it’s now called the 4000T. I just wanted to point that first because I was confused by the two names when I was looking at reviews for this and I’m sure many potential buyers are as well. I opted to go with the white glove delivery feature because I thought I would have trouble assembling it, but I watched the installers do their work and it looked pretty easy to do so. I think I could have been able to do it with the help of my grandson. they were just reading off the instruction manual just like we would have done, so I don’t think the professional installation aspect was worth it. We had an old massage chair that is probably at least 13 years old and it was on its last legs which is what made us want to look for a new model. It really is amazing how quickly technology has advanced over the past decade. I think we purchased that chair for well over $3000 at the time and this chair provides a million times better massage than the older model we have. One of the reviews said this chair was the best bang for you buck and I couldn’t agree more. The higer end models may have more advanced features but is more than good enough for us. I searched for chairs online for several months in several price ranges, but finally decided to take the plunge with this chair. Not only does the Osaki 4000T give the features that I needed (great massage), but the price range was well within my budget. The folks at Massage Chair Deals also were excellent to work with. Highly recommended! I just wanted to drop a line to note how much I appreciated Mike’s help with purchasing this chair. Not only did he make sure that the chair was delivered in time for Father’s Day, but he personally called us a few days after delivery to ask us how we liked it. Needless to say we’re thrilled with MassageChairDeals.com’s assistance throughout the process. Two months after receiving it, my husband is still using it at least once a day and he is always raving to friends and family that it has tremendously helped reduce muscle inflammation and has even helped improve his sleep pattern.